Daniel S. Mun ’05, a biology major who lives at the Chi Phi fraternity, has been missing since early Friday morning, authorities say. The MIT Police are working with Boston and Cambridge police to search for Mun, said Senior Associate Dean Robert M. Randolph. 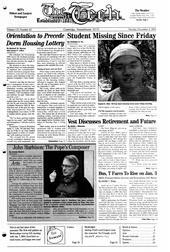 The schedule for Orientation 2004 moves the freshmen housing lottery until after the end of Orientation, and also shortens the length of Orientation to four days. President Charles M. Vest announced Friday that he is stepping down after 13 years at MIT. The Tech sat down with him Monday morning in his office to talk about his presidency and the future of MIT. MBTA spokesman Joe Pesaturo said that the fare increase was prompted by large discrepancies between revenue and expenses. “The T has a $25 million gap between revenue and expenses, and a projected $50 million gap between revenue and expenses for next year,” said Pesaturo. “The fare increase will close the gap. Once we have steady financial status, we can make improvements,” he said. A fire broke out at Theta Xi fraternity at 64 Bay State Road, last Wednesday, according to the MIT Police incident log. Following widespread public opposition, the Massachusetts Bay Transportation Authority has modified its Subway Performers Program Policy to allow for the use of amplifiers at a limited decibel level rather than banning them altogether. MIT has begun to switch faculty and students from magnetic swipe identification cards to “proximity” cards readable from a distance, but has yet to address the security concerns with both the new system and the old system as a whole.